This week we have put up a challenge to the Design Team to use ribbon. Ribbon is a product loved by many scrapbookers and there are many ways to use this product to enhance your scrapbook pages. Here at Aussie Scrap Source we carry ribbon from the following popular manufacturers - Strano Designs, Li'l Davis Designs, Heidi Swapp, Heidi Grace, Pebbles Inc, SEI, Carolee's Creations, Arctic Frog (as of today) and very soon We R Memory Keepers. Listed here are 10 different ways to use this wonderful, fun and versatile product which has taken the scrapbooking world by storm. Staple it - One of the easiest ways to attach ribbon to a page to give it a little texture, is to staple it. Simply fold the ribbon in half and attach with a staple to hold it in place either at the edge of your photo, to the end of a tag that holds your hidden journaling, or randomly as an accent. If you have a 12 inch stapler, you can set your staple anywhere on the page, or secure ribbon strips right across the page, tying them as you go. Tie it - You can tie ribbon to chipboard, to tags, to metal or acrylic accents or directly to the page through punched holes with or without eyelets set into them. Try ribbon cramming which involves securing a piece of ribbon across your layout and tying lots of ribbon pieces round it pushing each tied piece close up against the next. Rather than just tying in a knot, fold your ribbon in half and thread the doubled over piece through a hole and then pull the two ends back through the loop created. Use as a hinge for hidden journaling - Simply fold the ribbon in half and attach it to of a piece of cardstock or chipboard that sits on top of your page. Attach on the binder side so that the ribbon acts as a hinge allowing you to open the flap on the other side to reveal additional photos or the story behind your layout. You can have your hinge on either the outside or the underside. Use on a stencil - Spice up a purchased or handmade stencil letter, frame or other shape by layering ribbon strips behind it, wrapping ribbon around the edges to covering the stencil or accent completely, or simply tie/knot a few pieces of ribbon randomly to the accent. Sew it - A great way to attach ribbon is to sew it to your layout, either by hand or machine. Just place the ribbon where you want it and sew over the top. For extra texture, add some folds or twists in the ribbon as you go, or consider gathering or pleating, which does require quite a lot of ribbon though. Take a piece of ribbon 2 to 3 times the width of the area you want to cover and pleat or gather the ribbon. To pleat, work your way across the ribbon folding it on top of itself as you go and secure with staples, brads or thread. To gather, hand or machine stitch a gathering thread - either straight or zig zag - then pull the thread to achieve your desired result. The appearance can be altered significantly by changing the placement of your gathering thread and adjusting how tight you pull it. Use it as patterned paper - If you are struggling to find the right patterned paper for you layout, why not create your own using your ribbon stash. Ribbon is available in a multitude of colours, designs, thicknesses and textures, giving you endless possibilities here. Mix with patterned paper cut into strips that resemble ribbon strips too if you like. You can even print on the ribbon if you like. You might like to try weaving ribbon through slits made in cardstock to create a patterned background or perhaps just a feature strip. Use it with bookplates, buckles, sliders or ribbon rings - Weave ribbon through a buckle or slider, taking the ends to the edge of the layout for a more formal look, or cutting it a small way from your chosen bookplate or slider for a more casual appearance. You can either run the ribbon behind your feature embellishment or make a point of cutting the ribbon either side, folding the ribbon back on itself and attaching with a brad, staple or stitch. 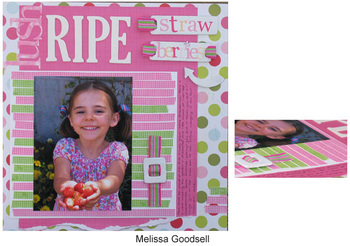 Frame a photo - Collect all of your ribbon scraps and place them randomly around the photo to form a mosaic effect frame. Alternatively use clean lengths of ribbon and attach around the perimeter of your focal photo as a photo mat. Try placing the ribbon a few centimetres away from the photo for a different effect. Hang things from it - String a piece of ribbon across your layout and hang charms, frames, washers, metal letters, alphabet buttons or even photos off a jump ring or safety pin or another piece of ribbon tied in a bow. Create an accent - Ribbon can be used to create gorgeous flowers to adorn your pages. There are many flower shapes and styles, including roses, daisies, pinwheels and tulips that are easy to achieve with ribbon. You can create a gathered flower by hand sewing a gathering thread right near the edge of the ribbon and pulling it tight. Bring the gathering thread in from the side a bit to create a different shape. Our step by step this week covers using ribbon as patterned paper. Melissa Goodsell has created this charming layout using Heidi Grace ribbon to add texture to her page, by using it the way you would use patterned paper. Start by choosing a ribbon that will work well with your layout. Using a pencil, mark out the area where you are going to use your ribbon, and measure. Cut your ribbon so that it fits in the marked area. There are a few ways to attach your ribbon. Double-sided tape is very effective in securing the ribbon in place, does not discolour the ribbon or leave marks on it, and does not require drying time. When you attach your ribbon, choose whether you want to leave gaps or overlap the ribbon. Be sure to check back next Tuesday to see what our Design Team has done with the ribbon challenge.